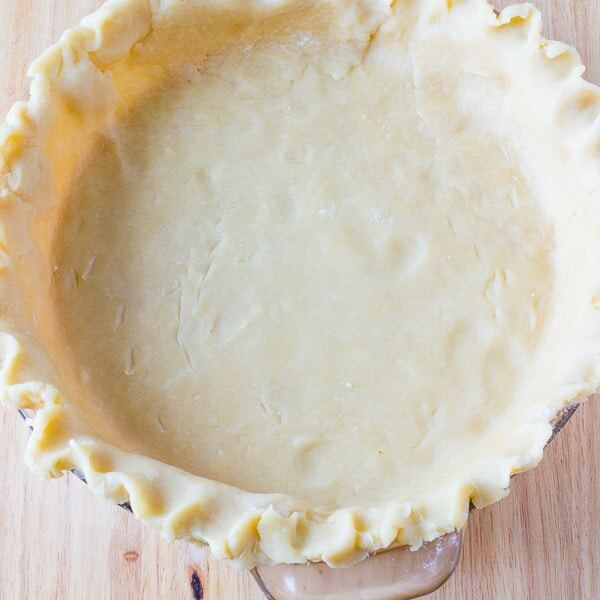 A step-by-step guide to making the perfect pie crust recipe. Making homemade pie crust might seem like a lot of work but it’s actually super easy to make. In my opinion, the crust is the main part of the pie. 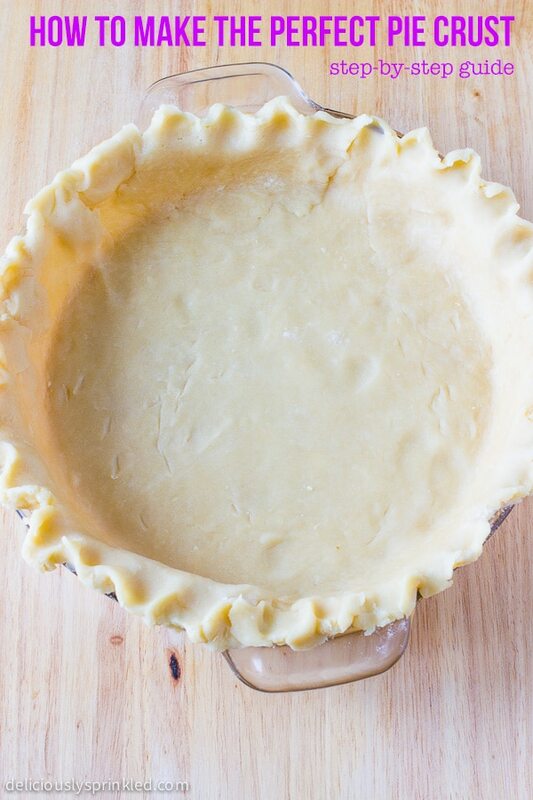 So here is a step-by-step guide on how to make the perfect and the best tasting pie crust. STEP 1: Put flour, sugar, and salt in a food processor. STEP 2: Add the COLD butter and COLD vegetable shortening. Cut cold butter into 18 pieces. Pulse until mixture becomes coarse, about 10-12 pulses. STEP 3: Sprinkle 1/3 cup of COLD water over the mixture and pulse until the dough starts to come together, about 8-10 pulses. If the mixture seems dry, add more water about 1 teaspoon. DO NOT OVER PULSE THE DOUGH! STEP 4: Turn the dough out onto a clean work surface, and gather it into a circle and flatten slightly. Divide dough in half. STEP 5: Wrap pie crust doughs in plastic wrap and refrigerate for at least 1 hour or up to 3 days. You can also freeze it for up to 2 weeks. STEP 6: On a lightly floured surface with a lightly floured rolling pin, roll the dough into 12 inch circle; about 1/8-inch thick. STEP 7: Carefully place pie crust dough onto a 9-inch pie plate. Gently press the pie dough down so that it lines the bottom and sides of the pie plate. Use a pair of kitchen scissors to trim the dough to within 1/2 inch of the edge of the pie dish. Put flour, sugar, and salt in a food processor. Add the COLD butter and COLD vegetable shortening. Cut cold butter into 18 pieces. Pulse until mixture becomes coarse, about 10-12 pulses. Sprinkle 1/3 cup of COLD water over the mixture and pulse until the dough starts to come together, about 8-10 pulses. If the mixture seems dry, add more water about 1 teaspoon. DO NOT OVER PULSE THE DOUGH! Turn the dough out onto a clean work surface, and gather it into a circle and flatten slightly. Divide dough in half. Wrap pie crust doughs in plastic wrap and refrigerate for at least 1 hour or up to 3 days. You can also freeze it for up to 2 weeks. On a lightly floured surface with a lightly floured rolling pin, roll the dough into 12 inch circle; about 1/8-inch thick. Carefully place pie crust dough onto a 9-inch pie plate. Gently press the pie dough down so that it lines the bottom and sides of the pie plate. Use a pair of kitchen scissors to trim the dough to within 1/2 inch of the edge of the pie dish. If you only need one pie crust, you can half this recipe.